I had the opportunity to attend the short residency and workshop, "For The Record", led by renowned artist and writer Coco Fusco at The Fine Arts Work Center in the summer of 2014. And for which I received an Archie D. and Bertha H. Walker Fellowship. The workshop focused on contemporary making and documenting strategies in performance art. The intensive culminated with a public open studio, for which I composed and performed "Scapegoat Monument", a performance that honored marginalized individuals in any society. I wore a blooming horned red headdress made of cosmos flowers and thin ribbons that hid my entire face, a black top with a pinned american flag and a white jacket with puffy shoulders, along with a blue makeshift plastic skirt. In one hand I held yellow flowers and in the other a piece of paper that read: "check one only: other". 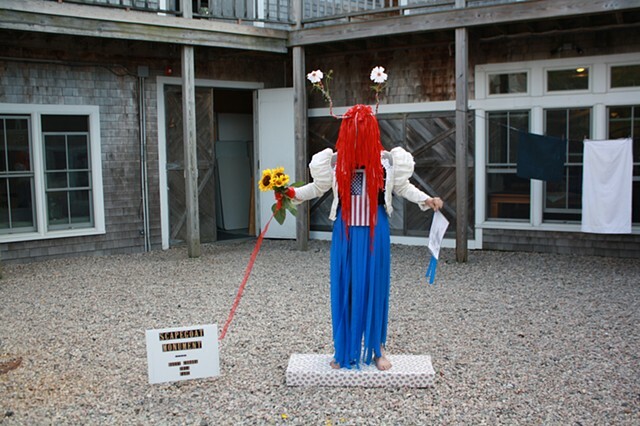 For one consecutive hour I stood barefoot and as still as I could on a low pedestal (covered with an american flag pattern) in the courtyard of The Fine Arts Work Center in Provincetown, MA. My vision was very obstructed by the headdress I wore and I developed a heightened sense of hearing. I overheard the writer Jacqueline Woodson high above me explaining to a visitor on the balcony that I was one of Coco's students subverting race with my performance. Many visitors appeared intrigued but reserved. One woman exclaimed "Oh yes, of course it's performance art. I saw Marina you know". This was the first performance art related residency and workshop at The Fine Arts Work Center.